COMERICA PARK PHOTO PRINT picture photo print photography for sale and DETROIT TIGERS COMERICA PARK DETROIT SKYLINE photo picture photograph art print photography for sale. The TITLE FOR ORDERING is: "Comerica Park Detroit Tigers 2000". Comerica Park Detroit Tigers skyline photo art photograph pictures poster print for sale. Detroit Tigers Comerica Park panoramic photograph print photo for sale: This Comerica Park Detroit skyline photograph is a picture photo of the entire baseball field and downtown Detroit skyline at the beginning of the inaugural season at the new downtown City of Detroit Michigan landmark home of the Detroit Tigers, Comerica Park. This Comerica Park Detroit skyline picture photo was made from an original black and white photograph that has been hand colored. In this Comerica Park Detroit skyling picture photo is also pictured the world's largest scoreboard and an exceptional black and white panoramic Detroit skyline view of the City of Detroit skyline and the downtown Detroit buildings and skyscrapers in the Detroit skyline. To the right of the Comerica Park scoreboard we can see the historic Detroit Athletic Club (DAC), The Renaissance Center and The Penobscot Building in this Detroit skyline picture photo. 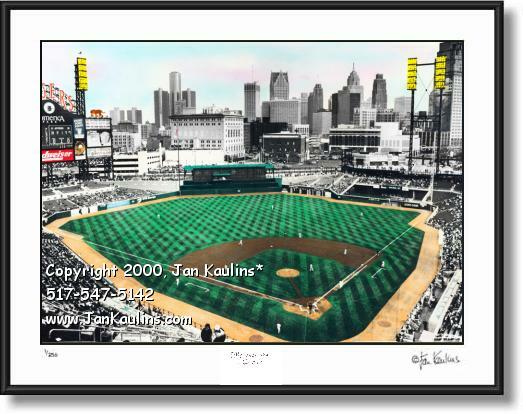 This Comerica Park baseball stadium and Detroit skyline photograph is an exceptional photo of one of The City of Detroit's favorite activities--summertime baseball. In 2005, Detroit Comerica Park hosted one of baseball's alltime favorite classic games, The Allstar Game! TO SEE THE MANY OTHER DETROIT PHOTOS FOR SALE IN THE DETROIT PHOTO GALLERY, INCLUDING DETROIT AERIAL PHOTOS, DETROIT LANDMARKS, HISTORIC DETROIT PHOTOS AND DETROIT SPORTS PHOTOS, CLICK ON THE 'BACK TO...' LINK ABOVE THIS PHOTO NEAR THE TOP OF THIS PAGE OR CLICK ON THE 'HOME-RETURN TO ALL GALLERIES LINK' BELOW.